February 24, 2019 at 9:51 am. 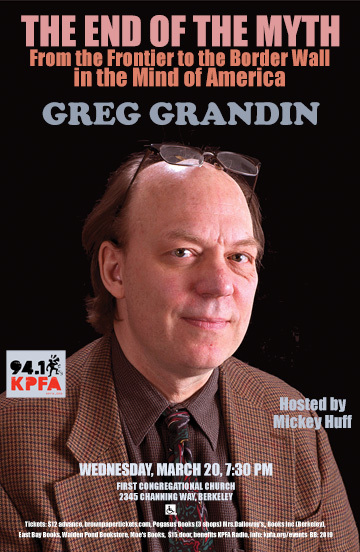 Greg Grandin is the author of The Empire of Necessity, which won the Bancroft Prize; Fordlandia, which was a finalist for the Pulitzer Prize, the National Book Award, and the National Book Critics Circle Award, plus a number of other widely acclaimed books, including Kissinger’s Shadow, Empire’s Workshop, The Last Colonial Massacre, and The Blood of Guatemala . A professor of history at New York University and a recipient of fellowships from the Guggenheim Foundation and the New York Public Library, Grandin has served on the United Nations Truth Commission investigating the Guatemalan civil war and has written for The Nation, the London Review of Books, and the New York Times.